The Vijayanagar Empire flourished in the South India as an unconquerable dynasty between the 14th and the 16th centuries. Today, the remains and ruins of the empire spread over miles of area. Hampi, once the capital of this invincible empire, accommodates some important remnants that have been identified as Group of Monuments at Hampi by UNESCO. 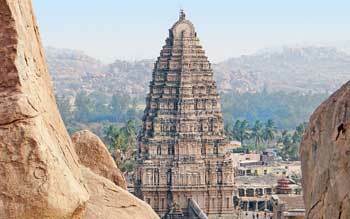 The history of Hampi dates back to the times of Ramayana, but it grew in significance under the Vijayanagar Empire. The Shiva Temple of Virupaksha is a prominent center of pilgrimage for Hindus. The temples was constructed in the 7th century but was expanded to its present day state by the Vijayanagar rulers. Some of the important features of the temple include pillared halls, huge gateways and multiple shrines. The 49 m entrance tower adds to the majestic beauty of the temple. Located on the banks of River Tungabhadra, Hampi offers a delightful view with rocks of different sizes spread all over. The main attractions of the empire’s remains include the huge temple complexes, including Hazara Ram Temple Complex. Known for frescos depicting scenes from mythological stories, complex contains many interesting carvings and inscriptions. Vittala Temple Complex, with its stone chariot and illumination at night, is another wonderful tourist place. Royal enclosures and Queen’s bath, along with elephant stables are among other structures belonging to the empire. Depending on the tour schedule, you may also explore other attractions like Lotus Temple, Yantrodharaka Anjaneya Temple, Hemakuta Hill temples and Lakshmi Narasimha Temple. An interesting feature of the place is the rock cut figures of various deities found all over. Shiva Lingams and monolithic statues of his bull Nandi are simply charming. Climb the Matanga Hill to watch the beauty of the setting sun, which is indeed a memorable sight. 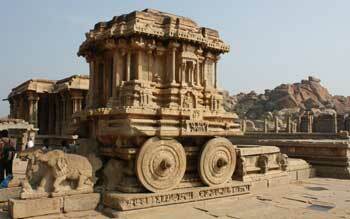 Hampi also has many other tourist attractions located just few miles away. One of them is Tungabhadra Dam which is located at the distance of around 15 km from Hampi. There are many small and big lingams of Lord Shiva alongside the river’s banks and your guide can help you access them. Anegondi, which served as the original capital of the empire, is only few miles away and is another site to find some interesting remains. Another suggested tourist place is the Daroji Bear Sanctuary that houses a good population of sloth bears. Walking or rock climbing is a fun exercise and the best way to explore the remains at Hampi. You may also prefer to hire a ride on motorcycles in the area. Ferry rides to cross the river are available for the interested tourists. Not just the history explorers, but all types of tourists can have fun at this visually delightful place having huge historic importance.